There’s nothing better than a cold, creamy scoop of ice cream, and it’s even better when you add unusual flavors, historical locations, and layers of sundae toppings. Missouri has plenty to choose from, and here are our 10 favorites. All Aboard Ice Cream descends directly from a Joplin institution: Anderson’s Ice Cream Parlor, founded in 1937 and voted “Best in the Four States” for several years. Anderson’s was forced to change its name after a company in the Northeast trademarked it, but the ice cream is made from the same delicious recipe used for 80 years. Made fresh daily and containing 14 percent butterfat, you won’t find ice cream like this anywhere else. The train decor adds a wonderful, family-friendly touch! The most popular custard at the Lake of the Ozarks can be found at Randy’s Frozen Custard in Osage Beach. The sundaes and snow cones go fast in the summer, and the length of the line will tell you everything you need to know about the taste! Try the ever-popular Tin Roof Sundae, or the delicious Strawanna. Quarts are also available for take home. Poppy’s claims to serve the best ice cream in the Kansas City Metro, and their sundaes, shakes, and malts make that hard it dispute. Flavors rotate frequently, so every visit is a new adventure. Customer favorites include Cherry lime-aid, cinnamon roll, and lemon cookie. Pitch Magazine recently named Poppy’s best ice cream in Kansas City. 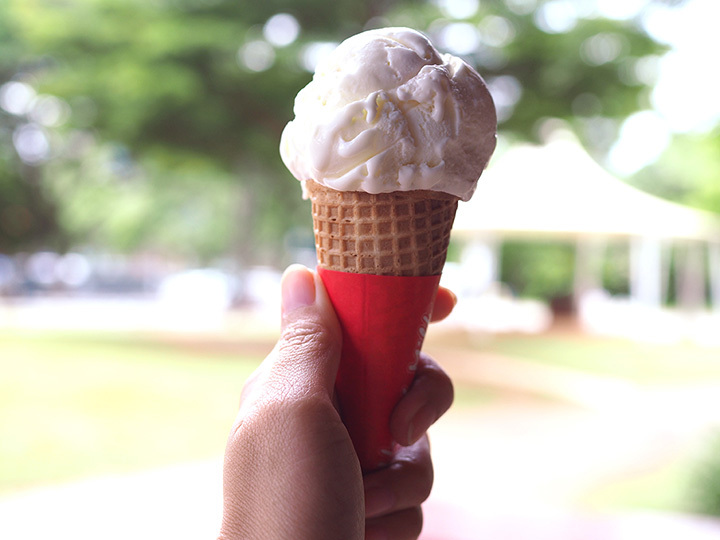 Whether you select a cup or a cone, you’ll have plenty of flavors to choose from, including Tahitian vanilla, browned-butter pecan, and mango with pineapple-cake. Jilly’s is also a cupcake bar, and cake is incorporated into a number of sundaes. Customers particularly like the Space Monkey, made with ice cream, warm caramel, banana, whipped cream, and toffee bits. With its nostalgic decor and old-style treats, Mr. B’s is one of Branson’s most atmospheric and enjoyable stops. It’s best known for its sundaes made from homemade ice cream, but the fresh lemonade definitely deserves runner-up status. Originally founded in Columbia in the early 1920s, Central Dairy moved to Jefferson City in the 1930s, and has been located in the same place ever since. They have been known for their homemade ice cream for nearly a century, but they also now carry some delicious flavors of frozen yogurt. The white chocolate almond may be calling your name! Although Clinton’s was founded in 1988, the building it’s housed in is a piece of history all on its own. When it was a drugstore, a young Harry Truman held his first job there, and so the owners of Clinton’s recreated an old-fashioned drug store counter and menu, complete with the best ice cream and phosphates around. They don’t make soda fountains like this anymore! Betty Rae’s prides itself on scooping some unusual flavors. You’ve got your chocolate, your root beer, your s’mores...but also your chicken and waffles, lemon poppyseed cake, and pineapple Thai basil. Even better, Betty Rae’s take out their ice cream truck for corporate events, birthday parties, and other special occasions. Customers come to Sparky’s for its originality. The menu changes often, so there are plenty of opportunities to sample new flavors. Favorites include caramel banana pudding, blueberry muffin, chocolate milk, and Red Hot Cherry Twizzler...Sparky’s ice cream makers will try anything once. While you’re there, look for the statue of Sparky the dog, and give it a scratch behind the ear. The Fountain on Locust is a one-of-a-kind ice cream parlor. Home of the locally famous Ice cream martini, as well as adult desserts and a menu full of classics, the Fountain also lays claim to be the most photographed restaurant in St. Louis. The Art Deco interior brings people in, but the unique soups, entrees, and of course, the ice cream, keep them coming back.